Having recently finished watching the complete run of the remastered episodes of the original series of Star Trek, I felt like diving into one of the later series. The release of the Next Generation in fully remastered format on Blu-Ray seemed a good place to start, so I bought the complete set with the intention of watching from the start. I've loved Star Trek since I was tiny. As a child, watching a black and white television set in Cornwall, there were two series that particularly fascinated me. One was Star Trek, and the other The Virginian. Whether this accounted for a lifelong affection for space and Westerns/cowboys/horses, I'll leave to the psychologists, but there's no doubting the vivid mark that Star Trek left on me. A few years later, after we had moved from Truro but were still living in Cornwall, two further pivotal events helped cement my feelings for Star Trek. I think it lasted about three weeks before the nacelles snapped off, but what a glorious three weeks they were. Surely this is the weirdest spaceship design to ever attain iconic status? From an engineering/physics point of view it makes no sense whatsoever, but it just looks right and for my money few of the later designs have quite hit the same marks. The second pivotal event was watching Star Trek in colour for the first time, at my grandmother's house in Barry. Even now, the original series looks very colourful, from the uniforms to the set designs to the use of lighting filters in many of the shots. In the early seventies, having been conditioned by exposure to the episodes in black and white, it was a real jolt to the eyeballs. The remastered episodes look very good, incidentally, with some sympathetic use of CGI to update some of the effects and sets. 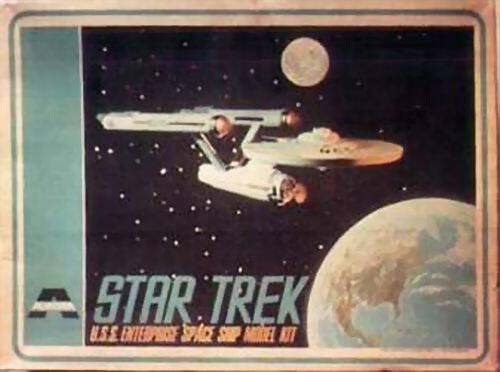 Star Trek was often on television in the early seventies. During school vacations, the episodes were broadcast in the morning in a format called "Holiday Star Trek", which I've taken to mean episodes which were deemed not to contain any overtly adult or upsetting themes, although whether that was actually the case I don't know, as it just seemed like a random grab-bag of stories to me. My admiration for the series was further reinforced by an article which appeared in Speed & Power magazine around 1974, consisting of a two-page feature which brought us exciting facts like exactly how big and fast was the Enterprise. Given that the Enterprise was deemed to be a bit less than a thousand feet long, I then became obsessed with relating this dimension to real world objects, such as the television masts near our home. I'd been told they were a thousand feet tall so I tried to imagine the Enterprise standing on its end, next to one of these masts. But that didn't seem anywhere near big enough to me. I had a similar problem with Captain Nemo's submarine -*. Anyway, that's enough rose-tinted nostalgia. Fast forward to 1988. Star Trek was coming back onto television and by some means that I don't quite recall, the pilot episode was available to be shown in one of the common rooms at Newcastle University. Thus, those of us who cared gathered round on plastic chairs to watch "Encounter at Farpoint". At that point, there had been a few hints about what to expect. We knew that the main captain was to be played by a bald British actor, that there would be an android, a Klingon, and so on. But in those pre-internet days there was far less in the way of "spoilers", so I remember going into the screening with very little expectation of what to expect. The prevailing view, as far as I'm aware, is that the pilot was an underwhelming opener to what would prove to be a weak couple of seasons, before The Next Generation really found its strengths. That certainly chimes with my recollections of that screening, in that the early appearance of "Q" - the recurring alien trickster figure - seemed to harken back to some of the hoariest episodes of the original run, in which super-powerful alien demigods were forever popping up on the Enterprise's bridge, usually in some sort of period costume. Rewatching "Encounter..." now, though, after a gap of nearly thirty years, brings a more balanced view. It's not actually that terrible. The pace is slow, and the stakes are never more than vague, but perhaps it needed that narrative space to allow scope for the characters to establish themselves. And, allowing for some stiffness in their interactions, there are welcome moments when the pilot takes time to allow the characters to present themselves, which perhaps wouldn't be the case if there was a lot more running around and shouting. Significantly, if you've splashed out on the Blu-Rays, it looks magnificent. They did an amazing, and by all accounts expensive and painstaking job, in restoring this series. The effort is worthwhile, because - allowing for the inevitable production economies of indoor sets masquerading as planetary locations - it holds up very, very well for a show made thirty years ago. Above all else, it's a reminder that there was a time when Star Trek was actually forward-looking, not afraid to move beyond its past. *- Verne describes the Nautilus as being seventy metres long. I think it some point I must have encountered a mistranslation which put the length at seventy feet, because I remember being convinced that this was nowhere near big enough. Because I can't ever get enough of this. So I've delivered a new novel. We have a possible title, but it's still subject to discussion and may well change, so I won't mention it just yet. What I can say is that the new book is the first novel-length work to be set in the Revelation Space universe since 2007, and is also a sequel to The Prefect. Despite the decade-long gap beween these books, this one is set only two years after the last and features a large number of recurring characters. Nonetheless I hope that it will be capable of being read independently of the first. As far as I am aware publication is not likely to happen until early 2018. I was in Strasbourg the week before last, delivering a lecture to the International Space University. Opportunities such as this, which offer the chance to meet with friends old and new, as well as visiting previously unfamiliar parts of the world, are one of the great blessings of being a professional writer. I also have the benefit of having had what is considered to be an interesting career trajectory, having gone from full-time scientist to full-time author. Time and again, opportunities have come my way that would perhaps be rarer were I not to have had this supposedly unusual dual citizenship in the worlds of the arts and sciences. I am extremely grateful. I had not visited Strasbourg before, so my wife and I made a short stay of it after I had delivered my lecture. Strasbourg was enchanting, a beautiful, compact city with wonderful winding streets and canals, its architecture betraying a long and turbulent history complicated by Strasbourg's close proximity to the German border. 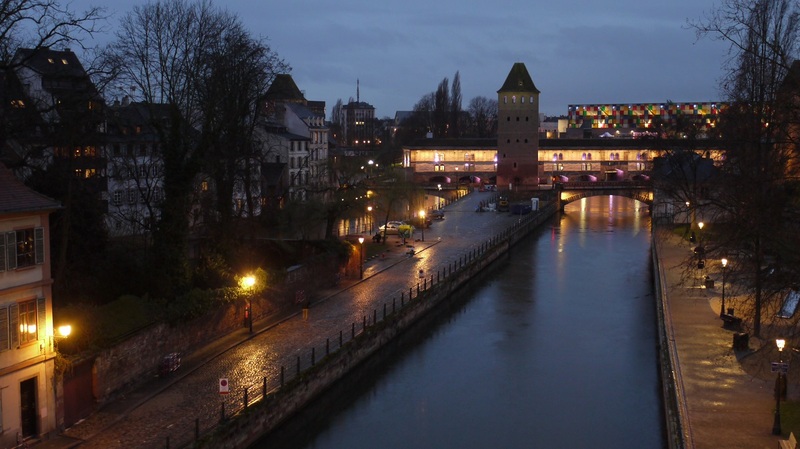 Indeed, Strasbourg has been both German and French in its time, as the border shifted one way or the other. Inevitably, it was impossible to visit the official seat of the European Parliament and not be reminded sharply of the imminent reality of Brexit, now seemingly likely to be driven through in the hardest of all possible terms. I wrote about Brexit before the referendum, articulating - to the best of my abilities - my reasons for thinking that Britain would be better off remaining within the EU. My position was admittedly based as much on emotion as logic, but I see no need to apologise for that. Emotions have been running high for as long as the referendum has been on the table, on all sides of the debate. Why not? It's an emotive topic, cutting across real lives and real experiences. I lived and worked in the EU, I benefited strongly from the free movement of workers across its borders; I even claimed unemployment benefit from the Dutch government when I was without work. I see myself as European in outlook and temperament. My wife is an EU national. We now live in the UK, and for at least half a decade considered our future settled. We were content to make our future in a country we both regarded as open, tolerant and forward-looking. All of that has changed since June. And yet, with a certain fatalism, I now accept the reality of Brexit. Barring some terrorist or military incident completely shifting the political landscape, there seems no way that it is not going to happen. Reasonable voices have been raised against it, and their positions summarily dismissed in the most insulting of terms - enemies of the people, remoaners, and so on. But acceptance need not mean an abdication of feeling. I "accept" Brexit in the same spirit that, if you are strapped to a table and someone is sawing your leg off, you "accept" that it will continue. Indeed, once started, the process - however damaging - had better be seen through to its dispiriting conclusion. I am convinced now that our leaders have already poisoned the discourse so thoroughly that it would be difficult for the UK to settle back into its former position within Europe, even if Brexit were immediately abandoned. It won't be, though. Like Basil Fawlty, bashing his head against the desk, it seems this is the reality we're stuck with. I was browsing the Guardian's music section when I saw the sad and shocking news that drummer John Lever had died. Never famous, Lever was nonetheless the driving force behind one of the enduring musical obsessions of my life, the underrated but quietly influential band The Chameleons. They were active in their initial incarnation for only five or six years, enough to put out a few singles, cut three albums, and record a number of radio sessions. They were completely unknown to me until the release in 1986 of the single Tears from their third album. I heard it played - and get mostly slagged off, I seem to remember - on one of those jukebox jury type programs on Radio 1. Something of its driving, start-stop energy must have stayed with me, though, because when I later saw the 12" ep of the single, I snapped it up. I played little else that summer. I still have that 12" and I still play it regularly. It's magnificent. I bought the album when it came out, which disconcertingly enough had a completely different version of the song on it, but which I came to love just as much as the single. I suppose you'd call it moody indie rock now, but at the time the only people I knew who had even heard of this band were some of my goth friends, and thanks to them I managed to hear the earlier singles, as well as the first two albums. Over the next few years, these records (and the various spin-offs by the band members, after the group disbanded) were rarely off my turntable. Nobody else sounded like them. You could hear their influence in lots of bands who came later,, but no one seemed to come close to the same magical alchemy of chiming guitars, soaring vocals and god's own drum sound. Someone once described John Lever's playing style as sounding like a man trying to smash a lathe to pieces. When I first heard the above track - Home is where the Heart is - I felt like it was a piece of secret music I'd been waiting my whole life to hear. I played it last week, as it happened, just because, and it still sounds as huge and terrifying and apocalyptic as it did in 1987, when I encountered it for the first time. I mean, listen to those drums. That's the end of the world right there - and bloody hell it sounds good. I thought I'd blown my chances of ever seeing The Chameleons by dint of coming to them a few months too late. They were gone by 1987, splitting up in acrimony after bad deals and the death of their manager. They deserved much better, and there was a second bite at the cherry around 2000-2001, when they reformed for some dates and a new record. I caught them twice, and they were as great and thrilling as I'd hoped. Both sets commenced, I recall, with the titanic A Person Isn't Safe, from their first album. Thank you, John Lever, for laying down your drum sounds on some of the greatest records almost no one has ever heard. Cast and crew of DD. Kneeling with the poster is John Henry Roberts, who played Richard Swift. Standing behind John is Steve Pickering, head adaptor. At the extreme left is Christopher Haimsworth, who played Roland Childe. Kneeling between the front and back rows is Abu Ansari, who played Captain Forqueray; just in front of Abu in red is Joey Steakley, who played Doctor Trintignant (spending the entire production in a mask). Katherine Keberlein, in white at the back, played Celestine, and just in front of Katherine, wearing purple, is Elana Elyce, who played Hirz. Just behind Abu and to the right of Steve Pickering is, I think, Lindsay Dorcus, puppeteer. I met all the other lovely people but I'm afraid beer and tiredness have fogged my recollection of names; I'll endeavour to identify them once this entry is posted. The week before last I attended two performances of Diamond Dogs at the Chopin Theatre in Chicago, the first adaptation of any of my works in any medium. 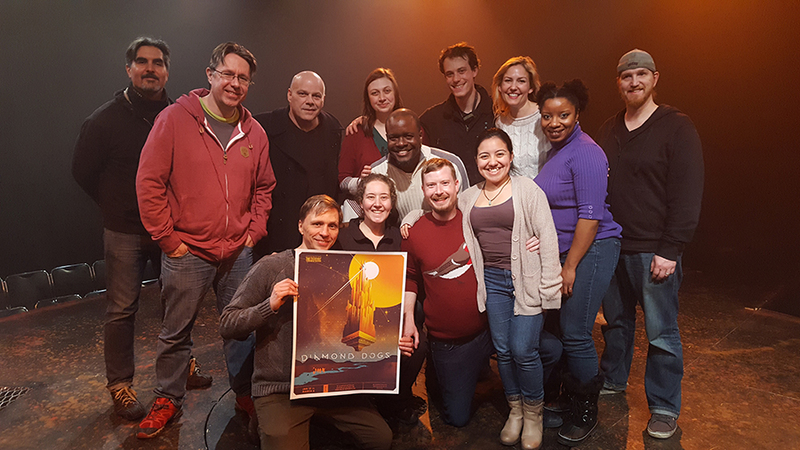 It's a memorably novel experience to be sitting in the audience, watching your own characters move around on stage, playing roles in a story and universe that originated in your own head. My story takes place in a range of locales, from the bowels of Chasm City, to a starship, to the ravaged surface of an alien world, and ultimately the many-roomed interior of the enigmatic alien structure named Blood Spire, an enormous tower floating just off the surface of the planet Golgotha. Depicting all this in film would be a feat in itself, and quite beyond any reasonable notions of practical theatrical staging. The solution adopted by the House Theatre was to use artful minimalism and suggestion, trusting in the audience to employ their imaginations given the narrative cues provided the actors and the sound and lighting effects. I thought it worked tremendously well, and the later stages of the story - involving the passing through of the puzzle rooms in the Spire - achieved a strange, stark beauty, all with little on stage but the illuminated, moving doorways and the actors in their spacesuits. 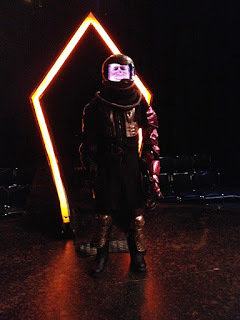 Later, as the story progressed to its grim conclusion, extremely effective use was made of the ingenious puppet designs of Mary Robinette Kowal, allowing us to follow the actors as they became something other than human. These latter scenes, aided by an unsettling score, had a truly surreal power. It was a tight fit (we used Abu's costume) but we just about managed it. The helmet, with its built-in LED system, was very cool. The costumes were the work of Izumi Inaba, and very effectively designed. That glowing structure behind me is one of the two moving doors which were used to depict the interior rooms of the Spire, changing colour appropriately. I was sad to leave the second performance, knowing there would not be a chance to see it again. It had been a long build-up to something that was over and done almost before it began, but such is the nature of these things and I couldn't have been made more welcome during my time in Chicago. Unfortunately the play's run has now concluded but hopefully one or two of my readers were able to get to see it. If they got half as much fun out of Diamond Dogs as I did, then it will have been an evening well spent. My thanks to all involved, and the very best of luck with your forthcoming productions.